Princess Diana: Princess Diana Death: Reconstructing What Happened From Eyewitness Accounts! Princess Diana Death: Reconstructing What Happened From Eyewitness Accounts! Princess Diana Crash: Five Minutes On The Road To Eternity! My previous post listed a number of eyewitness accounts that glaringly contradicted the official account and report of what happened! Click here to read it! August 31, 1997, the night that Princess Diana died is much shrouded in controversy and conflicting reports about what really happened. 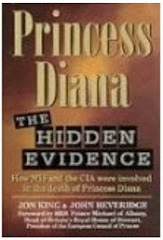 In fact there’s so much inconsistency over the events of that night, about the only aspect that isn’t under contention is the fact that at 12.20 a.m. in the night, Diana and Dodi in a chauffeured Mercedes with bodyguard Trevor Rhys Jones riding shotgun left the Paris Ritz Hotel and barely five minutes later at 12.25 a.m. were involved in a fatal car crash! Flushing The Prey Out Into The Open! For some inexplicable reason, Dodi Fayed and Princess Diana decided not to spend the night at the Ritz Hotel in Paris (which incidentally was owned by Mohammed Al Fayed) where they were dining, but instead opted to brave the howling and ravenous pack of paparazzi circling outside the hotel, by making a dash for Dodi’s apartment located on Rue Arsene-Houssaye. This in of itself was a very strange decision because from the moment they’d arrived in Paris from Sardinia on August 30th, they were incessantly hounded and harassed by paparazzi! In fact people were later to remark they had never seen paparazzi behave so aggressively (were some of those aggressive paparazzi really security agents (MI6) setting the stage for what was to come later?). Thus it is of vital importance to know what made Princess Diana and Dodi Fayed leave the safety and comfort of the Ritz Hotel to brave the paparazzi outside? Could it have been some security concern concocted by the plotters in an attempt to flush out their prey towards the trap they’d set? Assuming that Diana and Dodi were headed for Dodi's apartment the quickest route would have been to take the Place de la Concorde but according to several witnesses that route was blocked by a car full of paparazzi (quite likely that car was full of security agents whose job was to make sure that Princess Diana's Mercedes took their desired route, i.e., into the tunnel. Thierry H was one such witness who saw a car filled with men blocking the Mercedes' access to the Place de la Concorde. Motorbike And Unknown Car Force Mercedes Into Left Lane! Motorbike Weaved From Left Then To The Right! Brenda Well's statement also (significantly) distinguishes the powerful motorbike with two riders as being the only bike at that point in time behind Princess Diana's Mercedes. According to her account it was only after the crash that the rest of the paparazzi pack turned up! So now Princess Diana's Mercedes is in the left lane and speeding very fast towards the tunnel, almost as if the driver and occupants feared for their lives…suggesting what they had just experienced was not normal paparazzi behavior. Witnesses who were inside the tunnel at the time, also speak of a large powerful motorbike ridden by two individuals that raced up to the Mercedes on the left side, then pulled ahead slightly before swerving to the right of the Mercedes abruptly. At that point many of the witnesses claim they then saw a very bright flash of light followed by a tremendous bang! Two such witnesses were Francoise and Valerie Levistre who were driving ahead of Princess Diana's limousine in the tunnel. It is a well documented fact that Princess Diana's Mercedes slammed into the thirteenth pillar of the tunnel before bouncing off and smashing into the wall like a pinball; the narrow confinement and speeds involved increased the chances of fatalities. 1. Just before entering the tunnel the mysterious car in front of the Mercedes starts braking dangerously alarming Henri Paul who accelerates and veers to the left to overtake it. This was actually what the plotters desired, to get the Mercedes in the left lane. 2. The powerful motorbike with the two riders cuts off Brenda Wells preventing her from entering the tunnel at this crucial point (the fewer witnesses the better). The motorbike then surges forwards and quickly catches up with the Mercedes, squeezes between the Mercedes and the central pillars of the tunnel before pulling slightly ahead and swerving suddenly and dangerously to the right. 3. At this point Henri Paul, like most anybody else, would instinctively steer the Mercedes left to avoid the motorbike. But just at that moment the rider on the back of the motorbike used a laser strobe light which illuminated the previously dark tunnel with a brilliant white flash that blinded Henri Paul and everyone else in the Mercedes. 4. After the flash from the strobe light Henri Paul was temporarily and completely blinded but the image of the motorbike dangerously close in front on the right of the Mercedes would have been engraved in his mind so he would have continued his leftward drift towards the center of the tunnel in hopes of avoiding the bike. At this stage witnesses tell of hearing a loud bang! Could this have been a remote-controlled detonation that completely incapacitated the controls of the Mercedes effectively rendering all navigation impossible? 5. Henri Paul, despite being blinded, probably tried to make navigational corrections to ensure that the Mercedes somehow didn't slam into that concrete pillars in the center of the tunnel…and this is where the Fiat Uno came into play. This was the same car witnessed by Souad Mouffakir and her husband, who were in the tunnel at the time, moments before and after the crash. According to them the Fiat Uno had come from behind accelerating very rapidly and closing up to them as though it were about to overtake, but instead slowed down parallel to their car (inches away) almost as if the driver was waiting for something. He was…he was waiting for Princess Diana's Mercedes. The Fiat Uno's job was probably to ram the Mercedes ensuring that it collided with the column of the tunnel; in fact such a scenario pretty much reflects what Mouffakir said she saw. So in essence the Fiat Uno was the insurance policy…the finisher as it were. The job of the Fiat Uno driver was to make certain that the Mercedes slammed into the pillar! 6. The dozen or so men seen loitering in the tunnel moments before the crash by record producer Jacques Morel, were probably the clean-up crew. Their task was to tidy up the loose ends and make sure the scene reflected the accident scenario they had gone to great lengths to create. In all likelihood one of those men was the individual seen by a number of witnesses leaping out of the wreckage of the Mercedes as they got closer. He could have well been the man who removed Henri Paul's head of the blaring horn and this could also have been the very individual who introduced the lethal levels of carbon monoxide as well as alcohol found in Henri Paul's bloodstream (to make the accident look like the mistake of a drunk)! Stanley Culbreath a tourist from the US described the inordinately long delay before anyone tried to free Princess Diana. Of the one policeman he saw there, this is what he had to say: "It was at least 15 minutes before an ambulance arrived and the one policeman who was there made no attempt to help anyone who was in that wreck…"
Yup! It sure sounds like those men seen loitering about the tunnel a few minutes before the crash certainly had their roles figured out. Some of them probably changed into police uniforms and other emergency /fire crew uniforms to discourage anyone from attempting to help the victims (classic crowd control)! I am really intrigued by this subject, and I myself believe that this was no accident. This information, and these thoughts you have given, really have convinced me that this was MURDER!! !